Large herds of walrus bulls fattening up for summer in Bristol Bay have found a new spot to hang out, near a village on the Alaska Peninsula where they haven't been seen in decades. "I've never seen anything like that before," said John Christensen Jr., 35, tribal president in Port Heiden, about 450 miles southwest of Anchorage. He and his wife discovered the male herd in early April a few miles north of the village, while investigating a "horrible smell" they thought wafted from something dead. Instead, there were a couple hundred "snoring, farting, sneezing" walrus bulls lounging in the sand, he said. The group grew to as many as 1,000, he said. In recent days, it's been closer to 100. The whiskered "bachelor herds," part of the Pacific walrus population, have long ventured to summer feeding spots in the south while females and young follow the retreating sea ice far to the north, said Joel Garlich-Miller, a wildlife biologist with the U.S. Fish and Wildlife Service. The male herds are increasingly showing up at unusual beaches in summer, Garlich-Miller said, and it's unclear why. The last report of a walrus herd near Port Heiden was in August 1990, when about 275 gathered just north of the village, Garlich-Miller said. This year's walruses could just be seeking better feeding opportunities, after getting "diminishing returns" of the clams they prefer at long-used areas, he said. It's similar to what's been happening in the Chukchi Sea, where thousands of females and offspring have also been hauling out on Arctic beaches, such as Point Lay. That's happening because summer sea ice they use as a platform for diving hunts and breeding has shrunk, something that is linked to climate change. The Port Heiden situation is not as clearly linked to changes in the ice, he said. 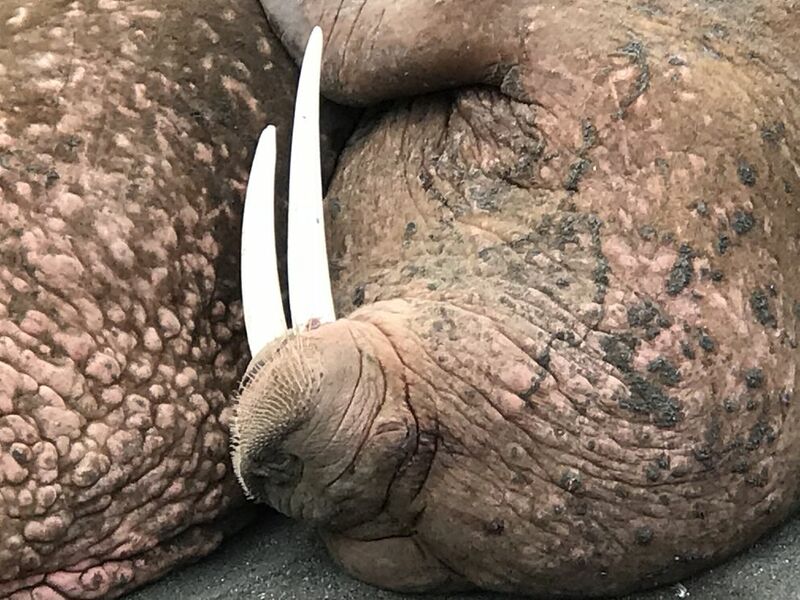 The Port Heiden walruses, first reported by Dillingham radio station KDLG, are likely heading out to feed on clams in deep water. They can do so for days at a time, with help from throat sacks they blow up like personal flotation devices, he said. They're returning to the beaches to rest. As for the male herds, the agency has received reports of bull herds colonizing new haul-out sites in Russia, Garlich-Miller said. They've also shown up at new spots in Bristol Bay, such as in Cape Greig more than 60 miles northeast of Port Heiden, for the last two summers. Garlich-Miller said during his two-decade career, bull herds typically hung out at four or five primary spots, such as at Round Island in the Walrus Islands State Game Sanctuary. "In more recent years, we have had more reports of scattering," he said. Whether the haul-outs are full of bulls, or females and young, biologists worry that humans will spook them, sending them into a potentially deadly stampede into the water for safety. "If they get a whiff of diesel or exhaust or perfume or cigarette smoke, that can cause a disturbance," he said. The federal agency in October decided not to list the Pacific walrus population, estimated at 280,000 animals, as threatened or endangered under the Endangered Species Act. Some people in the village eat walrus, but no one is hunting them, Christensen said. People are keeping a safe distance, too. He said he fears fishermen from other areas, after salmon fishing starts in June, could shoot at the walruses or try to drive them away. Garlich-Miller said that under the Marine Mammal Protection Act, actions that affect walrus behavior could be considered illegal harassment. The agency is asking people in boats smaller than 50 feet to keep at least half a mile away, while larger boats should stay more than a mile away. 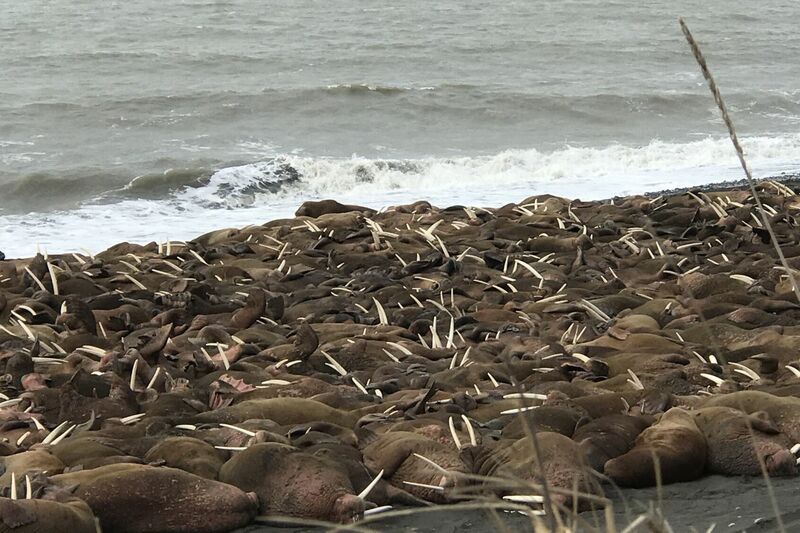 Scott Anderson, tribal environmental coordinator in Port Heiden, said the walrus herd has fluctuated, depending on the day, and moved to new beaches northeast of the village. About two weeks ago, he saw some 1,000 walruses gathered about 25 miles from Port Heiden. The smell was pungent. "There was a whole lot of flesh there," he said. "It looks like they are just sunbathing."